HOME > Event > Countdown to Carnival: Party Schedule. For the past 3 years Hipsters Dont Dance has been promoting the sound of World Carnival. Whether it’s through the club night, the mixes or the website we have always wanted to showcase the music that we love. We state that we play Hip Hop, Tropical and Dancehall but in reality its so much more. Music from our respective diasporas and the music that it inspires form the fabric of our lives. There’s one place that really captures that feeling and its carnival. Whether you are roaming the streets of West London or Calabar, wandering from soundsystem to soundsystem or watching the floats go by, carnival is a magic time. We have worked hard to create a similar musical atmosphere with our monthly parties and this year we are excited to be throwing our first carnival party during the August bank holiday weekend. Whilst others are fixated on bass, we decided to put on a party with DJs and Producers whose music cover the wide spectrum of Carnival. Join us as we celebrate the UK’s number one reggae dancehall label for a very special Big Chill Presents Necessary Mayhem’s 6th Birthday in a carnival style! Urban Nerds are back with our annual Carnival Special; the biggest bass fuelled Notting Hill Carnival warm-up party in London, hands down! Ninja Tune and Big Dada will be hosting a night this summer’s Notting Hill Carnival. On Sunday 26 August, we’re taking over The Paradise with: Coldcut, The 2 Bears Presents…(Upstairs Hosts), Adrian Sherwood, Zed Bias, Rebel MC, Sticky. Plus special guests. London’s, if not the world’s, finest reggae selector and performer teams up with the capital’s biggest and best dancehall and bashment crew, The Heatwave, for a massive Carnival after-party in Brixton. It’ll be worth the trek from Notting Hill, though, as the two will both perform their turbo-charged sets, joined by Radio 1′s Toddla T & Serocee, jungle don Kenny Ken, YoYo resident Smutlee, Rinse FM’s Josey Rebelle, the Deadly Rhythm Soundsystem and many more. After running their yearly sound system at 265 Portobello Road, Extra Stout will make the journey back to Hackney to host Mudd Up, east London’s wickedest carnival after party! DJs Jamie Rodigan, Hartley LP and Riddim Master will be playing the finest in carnival music, from soca to soul, ragga to revival, reggae to rap >> whistles, horns and colourful costume are actively encouraged ! Hosted by Samrai, with special guests TBA. 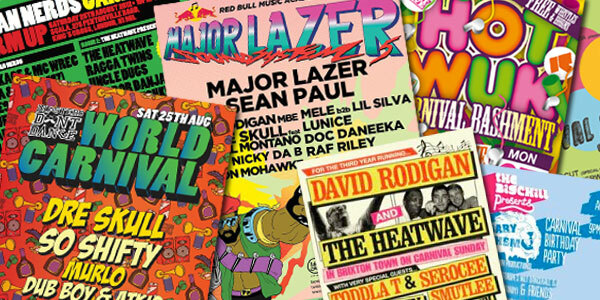 Calling the horn and whistle crew, Red Bull Music Academy and Major Lazer are proud to announce their return to the Westway, Portobello this August bank holiday for the now-legendary Notting Hill Carnival party. Now in it’s fifth year, the legendary Major Lazer Soundsystem will share the stage with Kingston MC ‘dutty yeah’ Sean Paul, Dre Skull & Machel Montano, Nicky Da B, Melé b2b Lil Silva, Lunice, Doc Daneeka, Raf Riley and some VERY SPECIAL guests. Did we miss any events? Please post them in the comment section.